How to Evaluate Diamond ASET Images? Read the Full Guide Here! 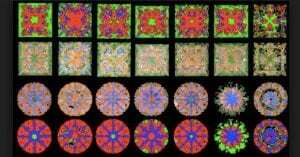 How to Evaluate Diamond ASET Images? I bet you’ve already seen the degrees of learning that presents itself once a curious shopper like you start digging into the diamond world. Heck, you just want a beautiful diamond, how come you’re here reading about ASET now? But it’s good, right? You know for sure, you’re getting your money’s worth! So, these levels of knowledge I’m talking about starts with a given label and a grading report. Then there’s tables of recommended proportions, magnified imagery, and even H&A and Idealscope. The next phase is to see the ASET image. We talked about how easy peasy it is to view Idealscope images. But can we say the same for ASET? Let’s find out! AGS doesn’t only use it for the cut grade, but it does have a big influence on it. The main advantage is that it can provide more information than the Idealscope. And for other shapes, it’s added info can be especially useful. Diamond hunting for other shapes is already a challenge given their lower demand compared to brilliant cuts and lack of cut information indicated in grading reports. Yep, most diamond labs don’t have cut grades for fancy shapes which makes it hard for shoppers to know of cut quality. This is where viewing tools and images come in handy. The Idealscope might show little light leakage since it only has three colors. But the same diamond viewed with an ASET might reveal that most of the light is being reflected with less intensity thus less sparkle. 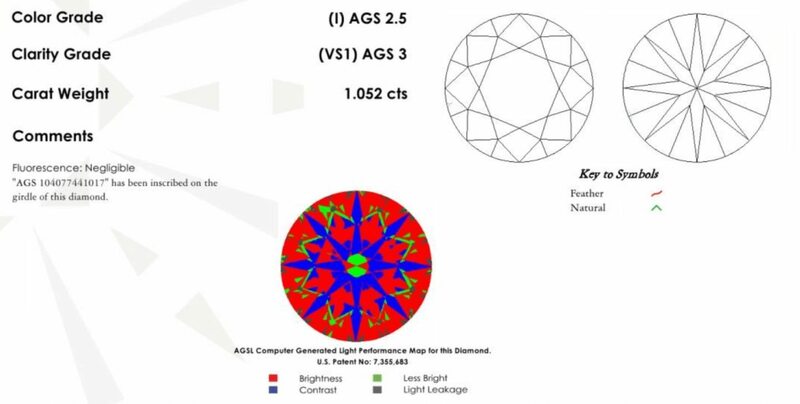 Simply put, it’s easier to read the light performance of diamonds whether it be a round or fancy cut given the added features of an ASET viewer. The ASET was developed to indicate how well a diamond is making use of the light around it. It does so by showing what range or angle of light the diamond is using. ASET specifically uses different colors to represent a differing angle range of available light. Thus, unlike the Idealscope, it doesn’t show direct areas of light leakage but from which angles the diamond is taking light in. The blue color represents light ranges of 75° to 90°. 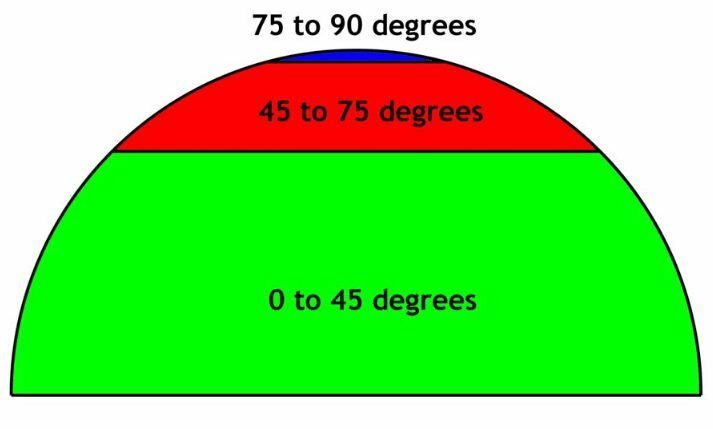 While the red is for 45° to 75°. Finally, the green color suggests ranges of 0° to 45°. Now, just imagine you’re looking at this diamond from above as is the case when you perform an ASET analysis. Logically, you will have the diamond taking in light from many different angles. What range of light a diamond can use naturally also depends on its surroundings. Very often, it is your own head that’s obscuring some of the available light to the diamond. But assuming that the lighting conditions are perfect, an ideal cut diamond will be able to use much more light of the 45° to 75° range than a poor cut diamond. The red is also the light that’s reflected the brightest. The more red color you see in an ASET image, the brighter the diamond will appear. 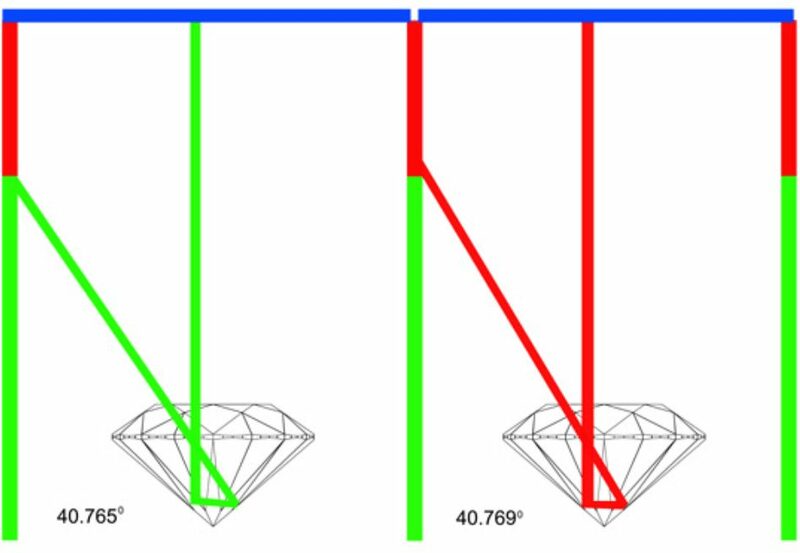 The green color represents the light that strikes the diamond from the 0° to 45°. These areas are perceived as less bright nonetheless still bright. Every diamond has these less intense areas to a certain degree. They also serve in providing a contrast, and we know from excellent diamond symmetry that contrast is good. As you can see, the average diamond displays white areas of light leakage and many green areas of less light return. Above average, on the other hand, has much fewer areas of light leakage but still have quite some green areas of diminished light return. While the Excellent cut diamond has the most red areas of bright light return. Common Confusion: Should the Center Dot Be Red or Green? Scientists from AGS found out that when the pavilion angle is above 40.768°, it will receive the red light from above 45°. When the pavilion angle is below 40.768°, it will receive the green light from the below 45° spectrum. There’s also a twilight zone in which the center can be somewhere in between red and green. 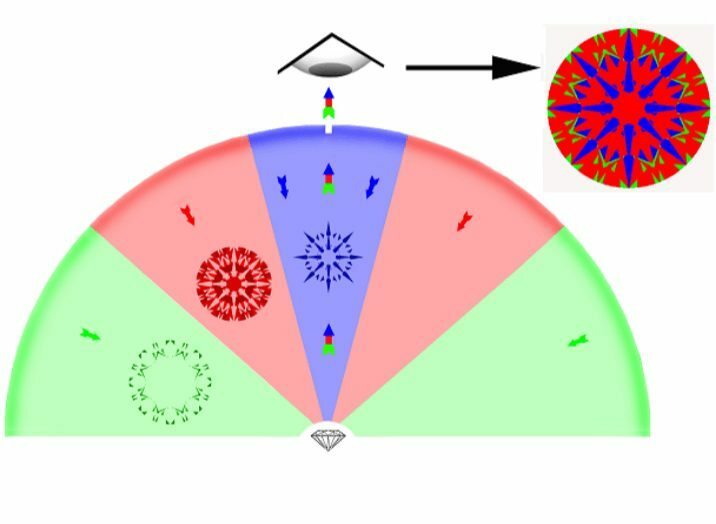 As a perfect pavilion angle can range anywhere between 40.6° and 41.0°, the center of a super ideal cut diamond in an ASET image can be either green or red. Case closed! Which diamond has a better light performance? It’s pretty obvious that the diamond on the left exhibits more green which means that it will have more areas of less light return. In this case, the diamond on the right would be the better choice. Let’s have a look at another example. Which of the following three diamonds do you think has the best light performance just based on the ASET images? As you can see, their ASET styles are somewhat different. This is what I wanted to demonstrate to you in this example. The left ASET image looks rather orange, the one in the has a darker shade, while the right ASET image is completely red! Cases like this are mostly due to inconsistent practices. The ASET images might have been taken with different ASET Scopes and in differing lighting conditions. The one on the right looks far too perfect, and I think it’s unreliable. It will be difficult to form a conclusive opinion when ASET images are taken in different conditions. Still, I think that, in this example, the left diamond would be the best choice as it’s the one with the fewest white[r] areas or light leakage. Now, with the help of ASET images, you should definitely be able to filter out low performing diamonds. Yes, it’s portable and as simple as it can be, but you would need a constant source of lighting when evaluating diamonds. Especially if you’re shopping online, which is what I would recommend as always, ASET images are handed to you upon request for free. While jewelers like James Allen, Whiteflash, and Brian Gavin Diamonds all have ASET images already included in the in-depth info for most of their diamonds. It’s pretty straightforward. The colors will tell you what you what to know. All you have to do is be wary of the black/white and green areas, and choose a diamond with more red signifying brilliance! Should you have any questions, please feel free to write to me. Or comment down below!